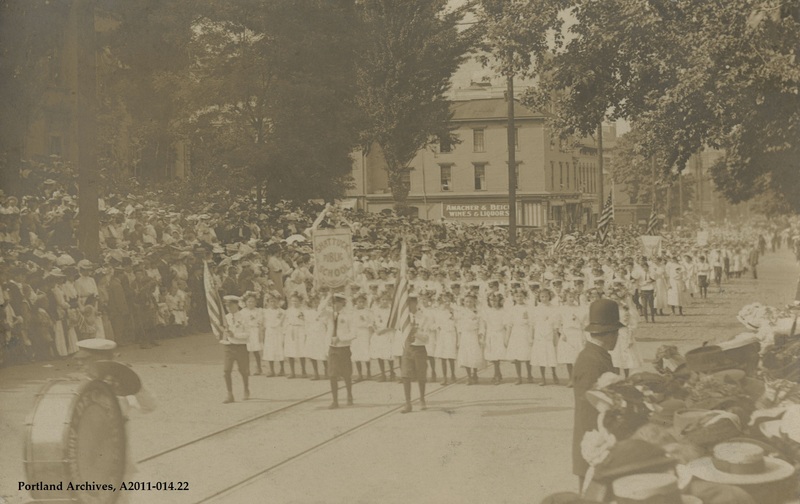 Shattuck Public School children marching in the Rose Festival Parade, 1909. City of Portland (OR) Archives, A2011-014.22. This is just a guess, but given the setback and details of the building to the left, I think they might be marching past the original Multnomah County Courthouse. I note the trees and open space on the the opposite side of the street. Perhaps taken along the South Park Blocks. Shattuck School, I attended kindergarten and 1st grade there before we moved. Wow. The school had quite a history. It was originally Harrison school (built in 1865) but renamed Shattuck in 1904, just 5 years before this photo was taken. The building was about 2 blocks from where Shattuck Hall now resides on the PSU campus. And that would be the roof of Meier and Frank’s over the saloon.